I'm not sure why other reviewers didn't mention how narrow these are, but if your feet are not VERY narrow, your foot will never go into these boots. I do not have wide feet, I have perfectly normal width feet and have never had to wear wide width shoes or anything. I usually wear an 8, so I ordered an 8 1/2 as it was recommended by others to order a half size up. I felt like the ugly stepsister in cinderella trying to squeeze my feet into this boot! There is NO way these would go on my feet no matter how large a size I ordered because of the teeny tiny narrowness of the shoe. It's almost as if you would have to have only 3 toes to get your foot in these. I don't see how anyone can wear them. They are very very cute, but don't appear to be made for a real person's foot. I'm disappointed--I REALLY feel that the narrowness should be emphasized in the description. The trousers came promptly as ordered. I was a bit sceptical of the size, but ordered according to yor chart, and they fit like a glove. Very comfortable, and look great. I am involved in a musical production of Pinnochio (late 19th century Italy) and the entire outfit works great. I have gotten very enthusiastic complements from the other members. I am looking forward to our performance, knowing I will look my part (a taylor) in the production. Service was great, too. The shirt I ordered came promptly, fit very well, and is REALLY cool and comfortable. Since this will be worn in a stage performance under hot lights, this is VERY important. I also got lots of complements from the other members. It was a real hit. The vest I ordered came promptly, and fit very well! I ordered this for a Competitive Chorus outfit, and it will look great on stage. The belt and pouch are very high quality, and it all feels very sturdy. However, the small is supposed to fit a 29-34. I'm a size 29 and it buckles at the first notch. I'm not sure how a size 34 is supposed to fit in this. I didn't have any problems; It's a great product, just be aware that it runs on the small side. This is perfect to hold my derringer while dressing for an evening out. One never knows when the need to protect oneself from zombies and other dastardly creatures will arise. Fits so well in my beaded bag and is such a ladylike way to dispose of nasty night creatures. So stylish and so practical. Go really well with my outfits and get a smile from folks as I go walkabout. I am looking for good quality steampunk/Victorian clothing and accessories and thought I would try the small items first. The bag is first quality, the yellow tint spectacles actually work really well in the sun up here on the North Olympic Peninsula (yeah, sometimes we do get some) and the other items I purchased were of equally good quality. Everything got here quickly and I am looking forward to making further purchases. 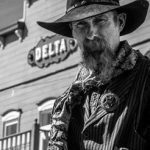 Your website was recommended to me by several other steampunk/Victorian folks in nearby towns, with the comment that you provided quality goods and clothes that were not costumes but were very wearable. Everything I order from you arrives very quickly, and I couldn't be happier. This arrived quickly and looks great, love it! A little expensive for the quality of product received. Needed item and your company had only one we could find. 50/50 Excellent service Yes Yes Agent who helped with purchased was OUTSTANDING. These are a cute accessory for reenacting going to a victorian Opera or live stage performance! Mine do not seem to actually focus adjust but love the authentic look and feel of these glasses! And the fact they work for the left or right hand! I actually own 3 Bathing Suits from Historical Emporium! This sleeveless style fits more to measurements, you do not have to be concerned with sleeves being too tight as this style is sleeveless. I would suggest one size up should fit or go by your bust measurement as this is an empire high waisted style of swim suit. Oh so cute and very comfortable to wear! Love it! These Pantaloons are good guality, love the ruffle finish on the legs. I normally wear a size twelve and ordered the large, they fit fine but I do not think anyone over a size 14 could wear these. They go fabulously with the vintage style bathing suits or as victorian under garments. Comfortable and easy to wear! The gloves arrived quickly, fit beautifully and looked great with the costume. Thanks so much! What I felt like when I tried to get my foot in this boot. All my shoes and boots are size 6.5 or 7, but this size 7 boot was so small/narrow I couldn't even get my toes past the throat. I like the style very much but had to return it. I bought this vest for a wedding. It turned out to be much, much nicer than I expected it to be. It's lightweight and has a good fit. The pricing is a little bit daunting, but its good quality. It is always great when someone under promises and then over delivers, and this is what you did. Excellent customer service! I have been in business for over 40 years and your service rates right up there with the best. I will be back to purchase and I will recommend you as well. Thank you. I needed something classy, rich and different for Friesian driving competition when this jacket ( in red)caught my eye online. I ordered one to fit my largest part(chest) . The jacket fit there perfectly and will be taken in elsewhere. It has generous length in the arms. It is quite well made, no skimping or sloppy workmanship. I would not hesitate to recommend this, in fact my friend who shows Peruvian Pasos is considering a brown one! Great Quality, Just what we wanted! I really love this shirt. It is comfortable and adaptable. It is casual and can be dressed up by adding a collar, I love the versatility. I love this beautiful blouse. The fit is right on and very flattering. The Evangeline blouse is very well made down to the smallest detail and is comfortable to wear. Thank you for providing such a fine product! This skirt is well made and looks sharp. It does run about a 1/2 to full size large. I will have a friend take it in rather than go through the trouble to send it back. I like the rich brown color. I'm 5'7" so the length is fine for me but if you are not as tall as me you may have to shorten it up a bit. Over all pleased with the Brushed Twill Convertable Riding Skirt. Extremely comfortable and fit perfect! Will order again from this site. Extra time was no problem with shipment. Love the outfit. Very comfortable and fit well. Loved the vest and blouse combination. I have already spotted other items I will purchase. Was given a broach of my grandmothers to wear at the neck to top off the outfit. Beautiful, loved it. This is another quality blouse. As far as fit goes, it is a bit large. I feel the blouse was properly represented and I'm sure period accurate. I am having some darts sewn in because I personally prefer a little more of a form fit but I do not feel that this blouse was misrepresented in any way. I am glad I purchased it. I ordered this on a Saturday and received it Monday. This coat is phenomenal! A beautiful jacket for my daughter's wedding. Yes, best to order the next size higher, but it fits like a charm. Just what I need for everyday wear as an interpreter. There must be some disparity in the sizes for different brands. I have ordered 2 pair of pants. One fits well with a little extra room and the other is a rather snug fit. Both were listed as the same size waist. It won't be a problem for me, but it might be for some. Prompt service and was exactly what I wanted. This shirt is beautiful. Great quality and it fit him well. Glad we got the medium even though the size chart was suggesting a small. This would be my only suggestion, that the size chart did not seem accurate. Really can't say enough good about the quality of this shirt. I loved that it had a small loop on the backside of the collar to hold the bow tie in place. This is a great hat at a resonable price! Very comfortable and perfect for keeping the sun off during our SASH matches. Hey, it holds my guns. It is pretty stiff so you will need to work it with some oil to customize the fit and get rid of the excess dye. They run a little big, I ordered a 40" but the real measurement to the middle hole was 46". Called customer service and they sent a replacement which arrived in two days. Can't say enough about the customer service at Historical Emporium...really good! Enough can't be said for the quailty of the customer service here. Friendly, curtious, understanding and very helpful. I'll keep ordering from these folks because I know if something isn't quite right they will do everything to make it right. Thanks! Bough two pair and we love them. Good grade leather, military grade buckles and a deep black dye. What's not to love. This immediately became my favorite skirt. It is comfortable, fits well, is built well, and suits my style perfectly. I get many compliments on it. I recommend everyone get one. Good products, delivered quickly. They are true to size, comfortable, classy, and timeless. I have been nothing but happy with this site, and I WILL shop again. And again and again. I like this petticoat very much, and I think it will work very well under my skirt. However, the sizes run enormous! This is not true to the sizing chart at all. I ordered a medium, since that's what I usually buy, and I could have fit another me in there. Fortunately, my husband has some tailoring ability, and he was able to take it in eight inches and up eight inches (I am also short). If you don't want to make adjustments, I'd order a size or possibly two sizes smaller than usual, but it's fun and well made. I was pleasantly surprised with how quickly my items arrived. Usually clothes take awhile, but I got this within only a few days. I received frequent communications, confirming my order, shipping confirmation, etc. I would order from them again. I knew that I wasn't buying the high end watch, and it is light weight, but it is good enough for what I am doing. The first one that was sent to me did not work, but was very quickly replaced. Thank you for the speedy service. I am so happy with my order. My daughter is having a "steampunk" themed wedding and The clothes I ordered are perfect. The sizing was spot on and the quality is better than I expected. And they arrived on the day they were expected. I have ordered items on-line in the past and have experienced every disappointment from wrong size to poor construction. Historical Emporium is the best. I will be ordering from you again. Thank you. Great craftsmanship and quality but was darker than "tan". I wish the fabric was a little heavier. You can tell it is a polyester. I will order again. I found this belt to be of the highest quality, it is by far one of the best I own. This is a well made dress. Fits well, lovely shape. Buttons at the back are perfect. However, the cherry red colour faded to a dull orange within one week from being exposed to the sun. Any place the dress was covered - under an apron, under the arms, even the shadow under the bust, remained bright red. All the rest is orange. It now looks aged and tired. Unfortunate indeed. Five stars for fit and construction. One star for colour fastness. Your customer service agent was very pleasant and animated. She offered an apology on behalf of the company for our dresses that had badly faded in the sun within a week and suggested that the dresses not be used in the sun because they were cotton!!!! More for indoor use. Perhaps, if that is the nature of the fabric, a small note of caution could be added to the details of the dress prior to purchase. Our historic site enjoys summer sun . . . which is why we chose the light and airy Amelia dress. Despite this disappointment, we will definitely continue to order from you. Your inventory is fantastic and care for authenticty is appreciated. I live in a small town outside of San Antonio, TX. Our high school Theater kids had moved from district, to area, to regional competition with their One Act Play. Two of the main characters were in desperate need of 1890's period pants. After searching many antique shops, thrift stores, and other online stores I came across Historical Emporium. We had two days to get the pants, and the website said it would take up to five days to get them. I decided to call instead of ordering online, and oh my goodness these amazing people were able to get the pants to me in two days. I was beyond thrilled and excited. One of the pair of pants unfortunately did not fit, and they were more than glad to have me return them for a refund. We decided to keep them for possible future use because of the great quality. I would highly recommend Historical Emporium. They were very professional, helpful, and great to work with. I hardly write reviews but I had to do this because very rarely would you see a product that looks even better than its online picture, I was very much satisfied with the product. By the description, I was hoping for something that looked a little more real. The piece that arrived is low quality plastic (I knew it was plastic, but was hoping for better appearance), and wasn't assembled very well. The simulated stone isn't mounted very well and the edges show, which makes it look really cheesy. However, it's a pretty low price, and I bought it only out of curiosity, so I don't really mind that much. I was very pleased with this ascot; At the price, I rather expected a kind of cheap, costume-quality piece, but when it arrived, it's better than many much more expensive items I've seen in stores. The color is beautiful. The fabric isn't the best synthetic I've seen, but I didn't expect it to be at this price. As always, shipping was super fast. These items arrived swiftly and in great shape. They were everything promised and more, and I like them so much I immediately put buttons in almost all my pants. The belt-buckle straps make adjustments super easy, and always even. They look just terrific, on either casual, work-chic, or formal wear. They're great!! Nice quality, quick shipping. Will recommend this site to others! TIE WAS VERY AUTHENTIC LOOKING FOR THE PERIOD....WAS VERY HAPPY WITH THE EASY USE!!!! WORE THIS FOR MY WEDDING!!! This vest is sturdy material; however the stitching is loose and unfinished in places... The button holes are poorly done, unfinished... But, it has a VERY NICE lining. One would be better to spend a little extra for a fine quality American made item. I spent about an hour with my sewing machine and now have a quality product. So, with that, I am pleased with my purchase. Comfortable, classy, functional, a great choice! Love these boots! Love this shirt! I wore it to a recent cowboy themed fundraising party. I received numerous compliments on the look and style of the shirt as well as how authentic it looked. The only reason I give it four stars is one of the bib buttons fell off just after I put the shirt on. I will have to have my local dry cleaner reattach the button as well as strengthen the others to prevent future issues, otherwise it would be five stars. I had been looking for a holster for my long barrelled .45 S/A revolver for along time and it wasn't until I found the Western Emporium website that I found the one I was looking for, and at a very REASONABLE price. I was very impressed with the look and quality of both the holster and matching gun belt. I am happy with the speed and quality of the service I was given and will not hesitate to order from Historical Emporium in the future or to recommend this company to any of my family, friends or acquaintances who may be interested in the merchandise they offer. I was very pleasantly surprised by the quality. I was concerned that I was ordering a costume but it turned out to be very usable. Historical Emporium has the best products, which are of excellent quality. The have exceptional variety and wide range of sizes. I have never been disappointed with the company. This shirt is absolutely great! I was needing a western villain costume to wear for our church's Vacation Bible School, but I was having a hard time finding something authentic since I'm a very large man. This shirt shipped fast, fits great, and really looks the part!! A truly wonderful ascot. Could not believe the quality. What a great item! While this vest was beautiful and well constructed, the 3x (52-54) is a little tight if you're a 54, but not so tight you pop buttons. My purchases exceeded my expectations, the items are so well-made, so beautiful and of high quality, the service was simply amazing, and I would recommend this company (and have) to my closest friends. I have a whole wish lists I look forward to filling over the coming months. Shopped the web extensively. Decided to go with Historical Emporium. It was a great decision! Very reasonable,accurate shipping charges along with a high quality tailcoat could not have been better. The coat size was a correct fit. You can deal with Historical Emporium confidence. They will certainly get more of my future business. Bought these pants to wear to a MountainMan Rendezvous and was thoroughly pleased with the style,construction and appearance of these pants. The pants are well made and fit the 1800's nicely. I will caution everyone to order 1-2 sizes larger than you normally wear ! Thanks Historical Emporium !!! I WILL be ordering more !!! I received this product promptly on the day it was due to arrive, and when I finally opened it and put it on, I marveled at its size and gravitas. Truly, this is a coat that widens the gap between your scientific mind and those of mere mortals. Like a lightning bolt, it makes your wardrobe come alive! This product immensely pleased me and even though it won't stay clean forever, nothing can stop this lab coat from creating a commanding presence. I got the right size, and the coat reaches down almost to my feet, so be careful to get the right size when you order this so that it doesn't drag on the ground behind you in an unseemly fashion. You want to look mad, not sloppy. In short, this was an amazing purchase and it probably won't be around forever, so if you're thinking of getting one of these coats, get one now, before it's too late! ... we flew into San Diego from London without an appointment ... the lady [name escapers me now, sorry] who served us 'squeezed' us in & we walked away with hat & a shirt. BRILLIANT!!! Why - niche productss Expectation - surpassed!! Service - top drawer!!! Return - you bet!!! Recommend - with doubt!! Thank you!! This is a beautiful, well made, close fitting coat! I really love how it looks! It does run small, so I got the medium...which fits me perfectly. Highly recommend this coat to anyone! The classic canvan work vest is incredible. It is very comfortable, sturdy and fits beautifully. Cut fuller than some of the vests offered the 2x I ordered fit perfectly. I highly recommend this product. This holster was a present for my father in law. We had bought him a .22cal pistol like he had as a teen. HE LOVED IT! The workmanship was fantastic and the color and detail was great. I can not say enough good things about this product. Very beautiful item it will be worn at my own wedding. I thought it may of been a little high on price though.